← Trump’s Most Corrupt Nominee yet. This is just another vacuous, sycophant, perverted trump offering. How long before the good people stop this nonsense? This should surprise nobody – republicans are the present day NSDAP. What’s the big deal? Lying is the lingua franca of the entire Trump Crime Family and Misadministration. 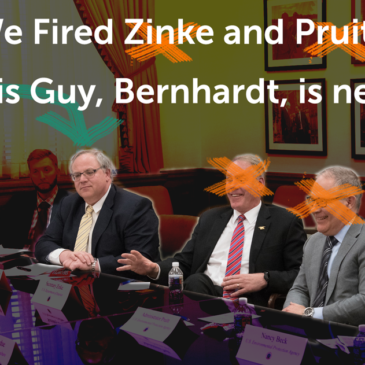 Bernhardt is further proof, as if we needed any, that there is no such thing as a “former” industry lobbyist. Like every Trump nominee for every position, he is (1) unqualified, (2) corrupt, and (3) NOT nominated by a lawfully elected president.